I love the fruit soya bean in Mr Bean, they taste great as they are not sweet. 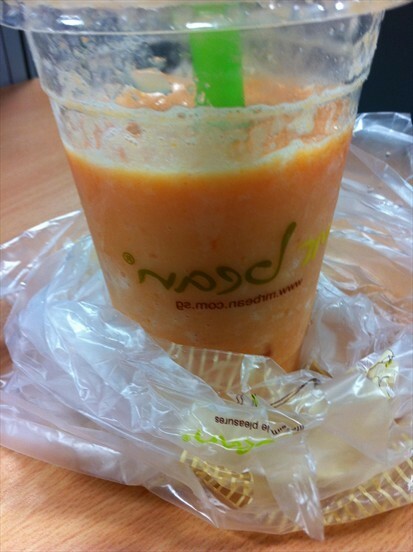 The papaya taste the best and I ordered that with ice blended. It costs $2 per cup, quite reasonable price for a cup of drink. The pancakes taste great too with a variety of flavours to choose from. Mr Bean is located almost everywhere in Singapore, therefore it is easy to locate the shop. Buns in Breadtalk are always fresh and tasty. I ordered the berries bun which costs $1.50 per bun. It was soft and yummy and I enjoyed it. Breadtalk is conveniently located at most shopping centres and you usually won’t miss the shop. The buns make a good meal for breakfast and tea. It keeps the stomach full and taste buds happy. I always enjoyed the food at Yoshinoya, the meal never fails me. I ordered the salmon bowl which costs $6.90. The rice was fragrant and smooth, and the fish was crispy. The overall meal experience was great. The shop was spacious, making it easy to find seats even though it was lunch time. The service staff was friendly and efficient in serving us. I have always enjoyed the beef bowl at Yoshinoya. The taste of it is great and the price is justifiable for the quality of food. It costs $6.90 per bowl ala carte. It costs additional to add on for miso soup and side orders. The dining ambience at Yoshinoya is comfortable and makes one feels at home as the shop is spacious and less crowded. Having passed by Toast Box, I decided to order a cup of tea with milk to satisfy my tea cravings. I preferred tea with milk as it tastes slightly sweeter and not as blend. The tea was cheap, at the price of $1.20 per cup. The taste of it was just right too, not too sweet and had a smooth taste. I enjoyed the tea and the service was of the staff was good as well, they were polite and friendly.